Today let’s look at display so you can show off some of your treasures. I want to attack some of your fears and “I don’t know hows”, answer a few of your questions and “how do I’s” and demonstrate how easy and quick it really can be. You may have official collections – a group of more than three items, similar in appearance, theme and appeal, purposely acquired. Or you might just have lots of individual things you’ve gotten and kept over time. To make it easy let’s just say you have some interesting stuff but don’t know where to put it or how to arrange it. “Put it” relates more to storage so we’ll skip that and go to the arrange part. 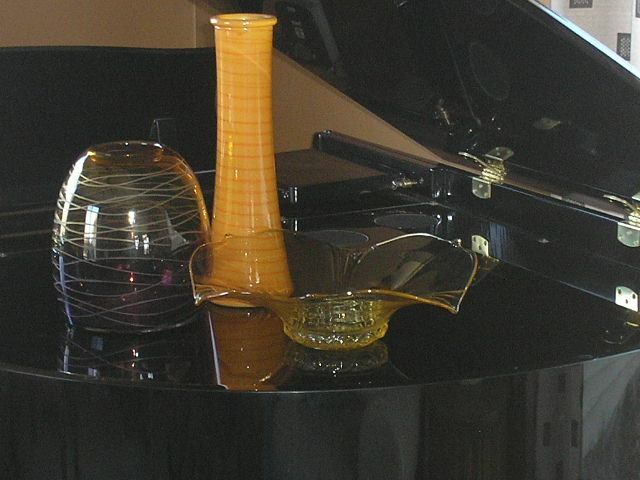 In interiors arranging primarily refers to furniture and big items. Arranging your treasures is simple display and whether you think so or not, display is simple and fun, so don’t fret. Most of us aren’t fond of rules, at least not a long list of them all at once. Any area of design does have rules, but try to think of them more as steps, stairs that you can use or skip as you choose. Before you start this climb, let’s shorten the stairway. Take a thorough look around the space. Besides furnishings, are there lots of other items gathered? Is stuff everywhere or a few things here and there? Display = organized grouping. Clutter = unorganized masses. 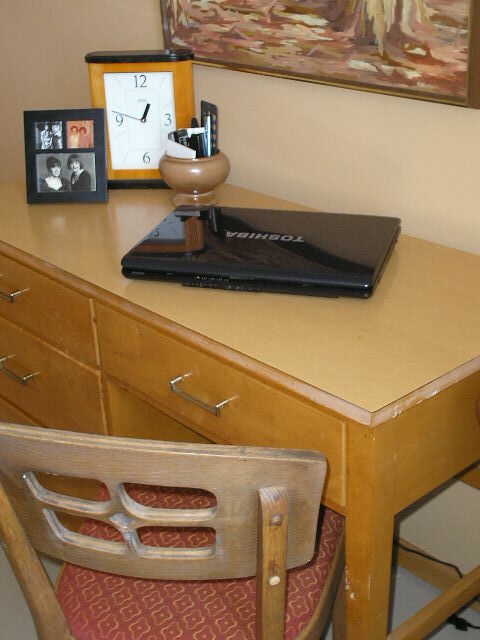 This article isn’t about cleaning clutter or storing it, so don’t go there. Just straighten up a bit. If there are piles and crowded shelves, for now just get a box or two for everything and clear the space up a bit. 1. Pick a Place. 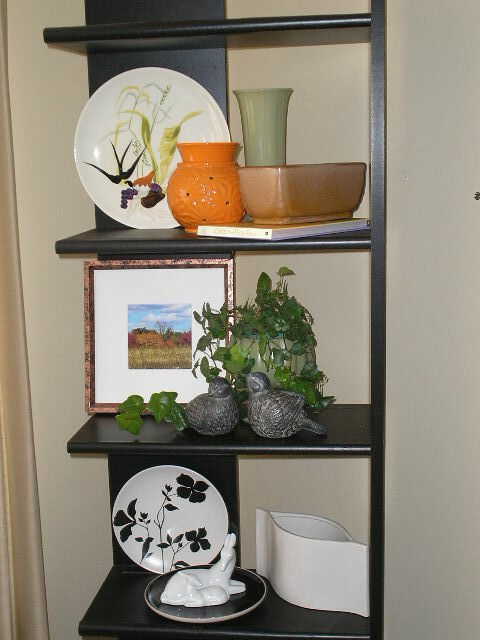 Where do you want to show off your display; on a shelf, table, desk, countertop? 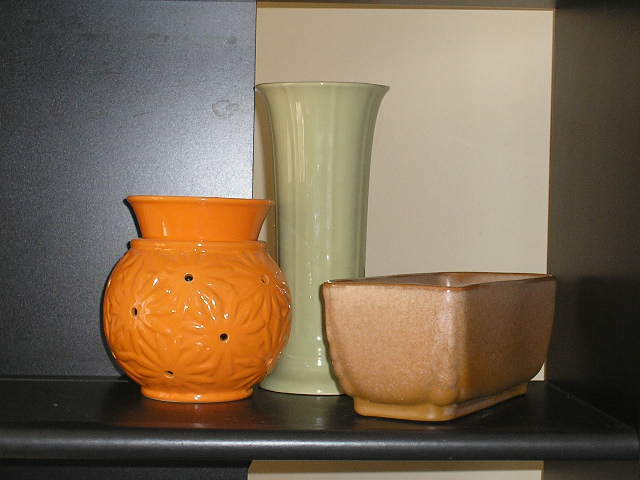 The space you use helps you choose appropriate items for your grouping. Keep the space in mind as you continue. 2. Concentrate on some of your favorite pieces; not just what you want to show others but items you, as the daily viewer, will enjoy. 3 Rule. Look for 3 pieces in 3 different heights; consider varied textures and colors, but the combination should be compatible. My Magic Number is THREE and three of my favorite (and most used) words are DIFFERENT, VARIED, and ADVENTURE. Three is a most useful number in design and display as you’ll soon see, but I apply it to nearly everything else as well. Different is just amazing, pure and simple. Most people strive to be unique, different from anyone else. We enjoy many different things. There should always be a different way to look at it. Variation is vital in both life and design. It creates intrigue, interest and texture, and when well balanced, it coordinates, communicates and completes any task or situation comfortably. And who doesn’t crave adventure?!? 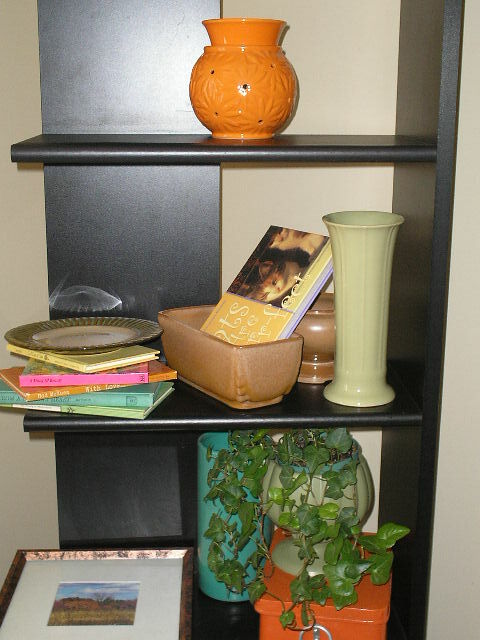 EXAMPLE: In the photos I chose a shelf on a vertical unit and gathered some favorite items. START WITH THREE VARIED PIECES. 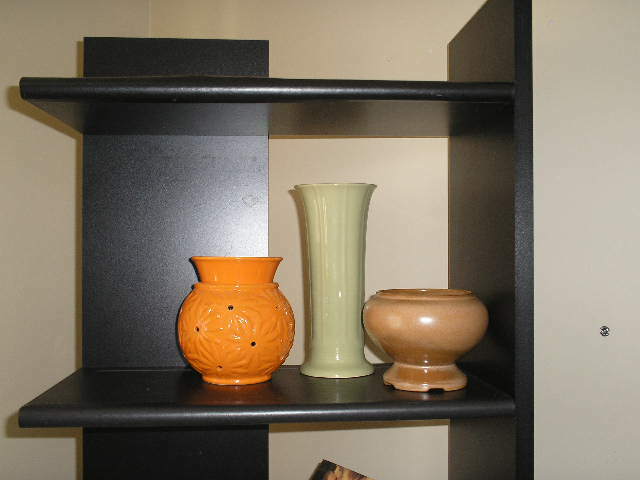 I started with the orange ceramic piece at medium height, next a tall greenish vase and last a much shorter brown piece. EVALUATE. I didn’t like the two round pieces together in a small group so switched the smallest for a rectangular item at the same height. This is fine as is, but I wanted some BACKGROUND so added the plate that had the three previous colors in it. EVALUATE. I didn’t like the even number of objects and wanted some texture, so to ANCHOR (also called FILLER) I added a book beneath the rectangular piece at the same angle. EXAMPLE: I was happy enough, so went on to the shelf beneath. 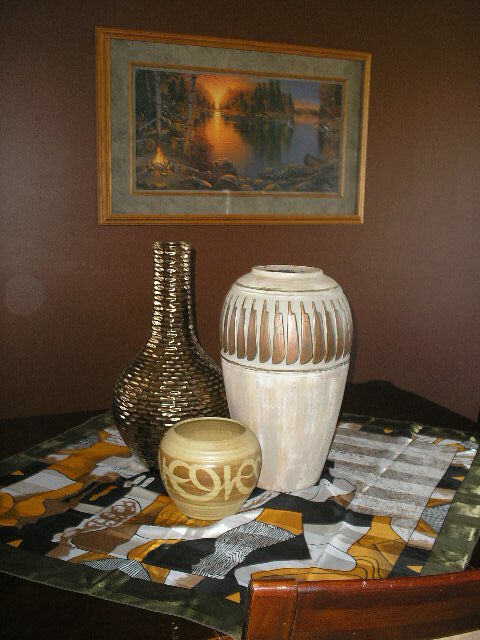 THREE items; nature photo, pair of carved birds and a green ceramic vase. I used the photo for BACKGROUND, the birds and vase in the display and added a plant for texture (FILLER). 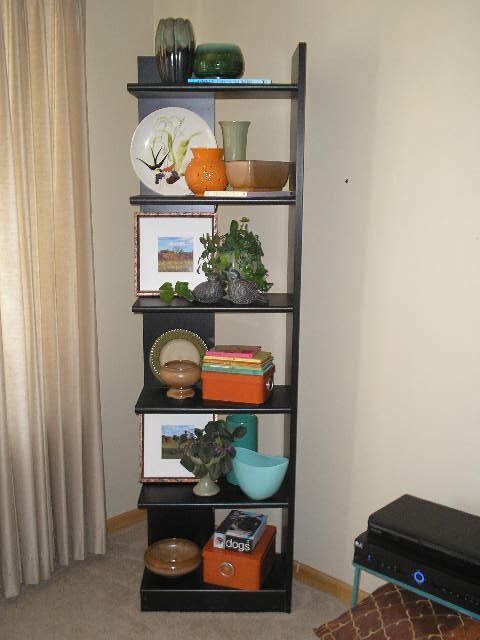 Featured are photos of the completed shelving unit. Live with it for a time, and change it if and when you want to. I told you, display is easy as 1-2-3. 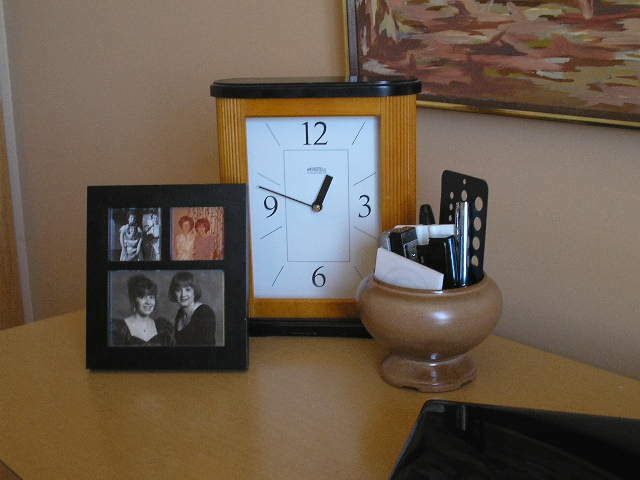 Many displays aren’t just for looks, they are functional as well, such as your practical desk items. 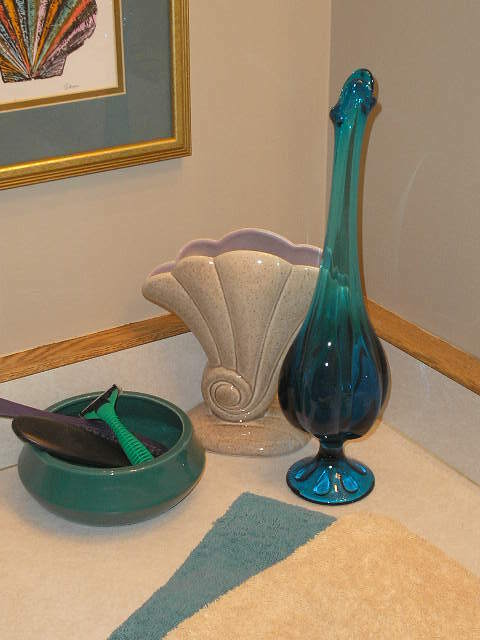 Here in a bathroom, useful necessities are part of the decor. The display is pulled together with color, subject and function. The featured tan and turquoise are also in the shower curtain not pictured. 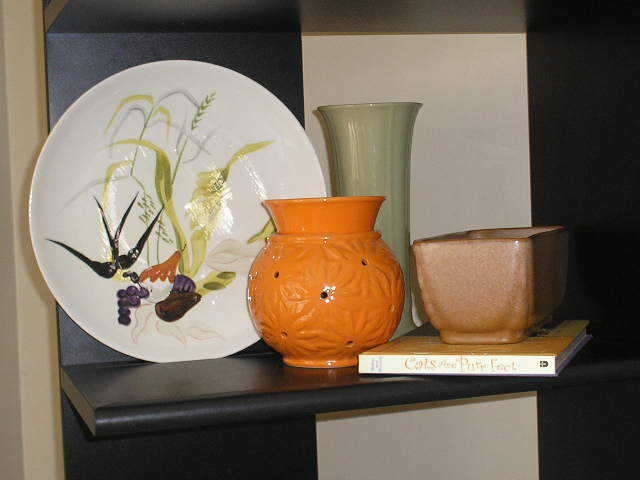 The shell shaped vase and the shell in the painting blend subjects, and one of the decorative vases is serving as a holder for small, often used items. Sometimes a few prime items are enough. The big table featured at the article’s beginning needed to be balanced with a big arrangement. THREE large pieces, ANCHOR with a beautiful scarf for the table cloth, and a bold wall and colorful artpiece as BACKGROUND. Don’t overlook unusual places and spaces to feature your displays. Just experiment and have fun. It’s just as easy to change as it was to set up. Don’t stress – just start. This entry was posted in Display by Cheryl @ Artzzle. Bookmark the permalink.